I know many of my readers have inquired about VCSIM (vCenter Server Simulator) which was a really useful tool that served a variety of use cases, but unfortunately it had stopped working with the VCSA 6.0 release. VCSIM is another topic that is near and dear to me and it is something I continue to push and advocate for internally at VMware. Earlier this week, I came to learn about a cool new incubation project that Doug MacEachern had been working on for some time now. 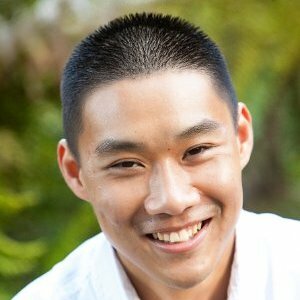 Doug is an awesome VMware developer working on the vSphere Integrated Containers (vIC) project and he is also well known for his active contributions to both govmomi (vSphere SDK for Go) and govc CLI. As you can probably guess from the title, the name of the project is called govcsim and it is a vCenter Server and ESXi API based simulator written using govmomi. It creates a vCenter Server model with a datacenter, hosts, cluster, resource pools, networks and a datastore. The naming of the objects is similar to that of the original VCSIM mode that was included with the VCSA. The number of resources can be increased or decreased using the various resource type flags. Resources can also be created and removed using the API. Doug had developed the tool to provide an easy way for their team to test some of the work they are doing with vIC. The tool is still under incubation but continues to received enhancements. In fact, the other day when I had used it for the first time, I had found a couple of issues which Doug resolved immediately. I got a chance to give govcsim a spin the other day and currently you can connect to it using govmomi, govc, pyvomi (vSphere SDK for Python) or rbvmomi (vSphere SDK for Ruby). It currently does not work with PowerCLI (connects but no inventory), I know this is something Doug is currently looking into. You might also be able to connect using other vSphere SDKs but these are the ones that Doug and I have tried so far. In the previous article, we walked through the installation of govmomi which is the vSphere SDK for Go and govc which is a command-line interface that uses the SDK to expose vSphere functionality which is used in the Kubernetes vSphere Provider. Now that we have all the prerequisites installed, we are now ready to deploy a Kubernetes Cluster onto a vSphere based infrastructure. UPDATE (10/26/15) - It looks like the instructions on setting up a Kubernetes Cluster has since changed and I have updated the instructions below. One of the main changes is instead of building from source we are just downloading the Kubernetes binaries. tep 1 - You will need to download the latest Kubernetes binary (kubernetes.tar.gz) which can be found here. At the time of updating this article, the latest is v1.2.0-alpha2. 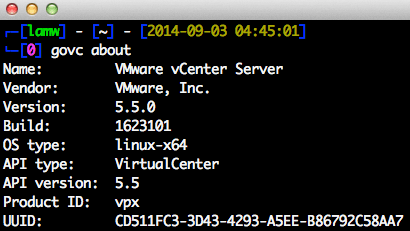 Step 4 - Once the VMDK has been extracted, we will need to upload it to a vSphere datastore. Before doing so, we need to set a couple of environmental variables that provide connection details to your vSphere environment. Below are the commands to set the environmental variables, you will need to replace the information from your own environment. You can leave the last three variables as-is. The GOVC_RESOURCE_POOL defines the full path to root Resource Pool on an ESXi host which will always exists and for vCenter Server, it is the name of the vSphere Cluster or Resource Pool the GOVC_GUEST_LOGIN is the credentials to the Kubernetes Master/Node VMs which are defaulted in the VMDK that was downloaded. The last variable GOVC_INSECURE is if you have an ESXi or vCenter Server using self-signed SSL Certificate, you will need to ensure this variable is set. Note: If you see a message about "Docker failed to install on kubernetes-minion-N" it is possible that this related to a timing issue in which the Minion may not be up when the Master is checking. You can verify this by running the next command, else you can follow the instructions to bring down the Kubernetes Cluster and re-creating it. Hopefully this gave you a good introduction to the new Kuberenetes vSphere Provider and I would like to re-iterate that this is still being actively developed on and the current build is an Alpha release. If you have any feedback/requests or would like to contribute, be sure to check out the Kubernetes and govmomi Github repository and post your issues/pull requests. 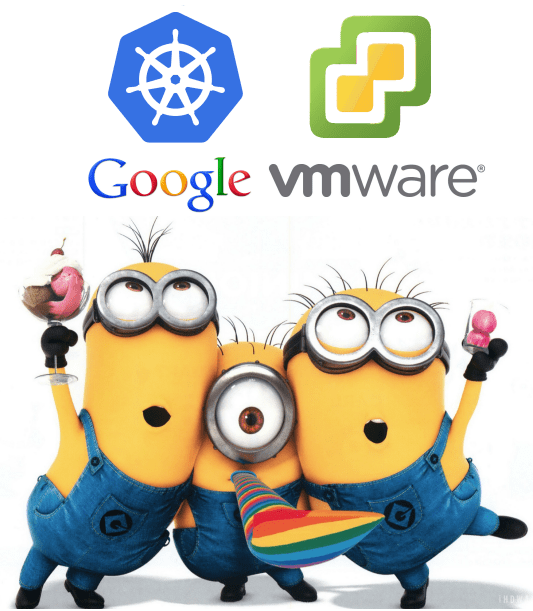 One of the exciting announcements that was made last week at VMworld was the joint partnership between Docker, Google, Pivotal and VMware. Paul Strong (Office of the CTO) wrote a great blog post Better Together – Containers are a Natural Part of the Software-Defined Data Center where he goes into more details about the partnership. The really neat part of the announcement which I think some people may have missed is that this was more than just an announcement. There are actually active projects currently being worked on, most notably a working prototype for a Kubernetes vSphere Provider. For those of you who are not familiar with Kubernetes, it is an open-source project that was started by Google which provides Container Cluster Management. You can think of Kubernetes as a placement engine/scheduler for Containers, similar to how vSphere DRS is responsible for scheduling Virtual Machines. The Kubernetes vSphere Provider allows you to run a Kubernetes Cluster on top of a vSphere based infrastructure and provides a platform for scheduling Docker Containers running on top of vSphere. 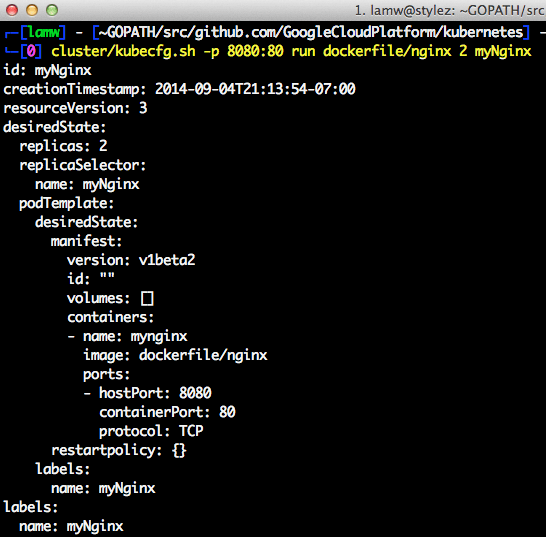 Kubernetes is completely written in Go (short for Golang), a programming language developed by Google. To be able to easily integrate with Kubernetes, a Go library needed to be written for the vSphere API and hence govmomi was born! Similar to pyvmomi and rbvmomi which are vSphere SDKs for Python and Ruby respectively, govomimi is the vSphere SDK equivalent for Go. The govmomi project is an open source project lead by VMware and you can find the Github repository at https://github.com/vmware/govmomi. 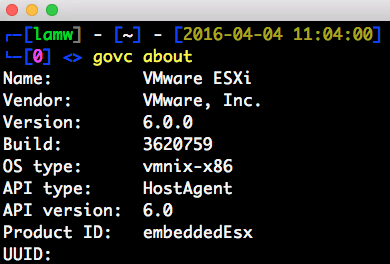 In addition to govmomi, I also learned about a neat little CLI that was built on top of the SDK called govc (currently an Alpha release) which provides a simplified command-line interface to a vSphere environment leveraging govmomi. You can find the source code under the govmomi Github repository https://github.com/vmware/govmomi/tree/master/govc. The Kubernetes vSphere Providers leverages govc to be able to orchestrate the deployment of a Kubernetes Cluster on top of vSphere leveraging the vSphere API. At this point, govc has been installed. You can now connect to either a vCenter Server or ESXi host. The easiest way is to specify the vSphere API endpoint and credentials is by setting a couple of environmental variables, so you do not have to specify it on the command-line. If everything was successful, you should see some basic information about the vSphere API endpoint you have connected to. In the example above, I am connected to a VCSA (vCenter Server Appliance). 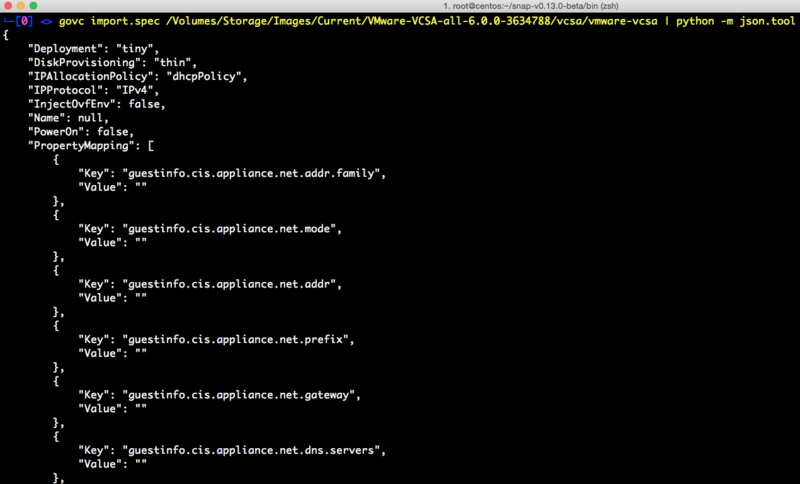 The govc CLI is quite similar to RVC with commands broken up into various namespaces. However, one feature that is not there today is the ability to tab complete the commands which is something I just love about RVC! As you can see from the screenshot above, some basic information is displayed about my ESXi host which is running on a Mac Mini. If you would like to learn more about govc, I highly recommend you check out the govc repository on Github which has additional documentation. You can also file any bugs or feature requests you would like to see on the project page. At this point you are now ready to proceed to the next steps which is to setup Kuberentes and deploy a Kubernetes Cluster onto your vSphere environment. Unfortunately I ran into a problem while going through the Kubernetes deployment and I did not know where to go next and decided to file a Github issue here. To my surprise, I immediately got a response back from the VMware Engineers who are working on the project. I had a couple of email exchanges with the team to debug the problem. It looks like we found the culprit and I was able to get Kubernetes up and running. 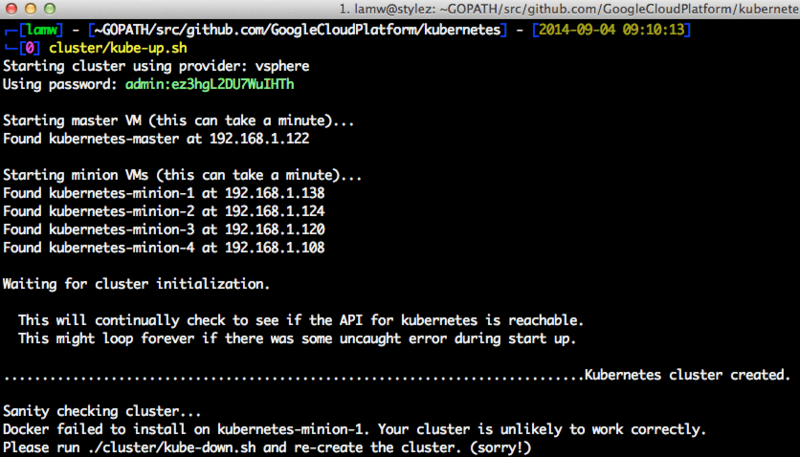 There are a couple of minor caveats which I will explain in more detail in Part 2 of this post and walk you through the steps of deploying a Kubernetes Cluster running on top of vSphere.